Linkevicius made the statement in Tbilisi at a conference organized by the McCain Institute and the Georgian Economic Policy Development Centre. 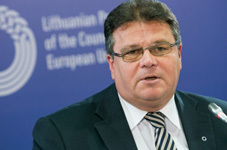 Linkevicius also said that it was the mistake of the international community that foreign countries did not place sanctions on Russia after the Russia-Georgia 2008 war. He stated that some new forces are coming in power in the west, which have an “illusion” of improved actions by Russia. “However, at the same time, more and more countries are better aware of the Russian threat, not because of the Russian illegal actions in Georgia or in Ukraine, as they have experienced themselves how dangerous the country is,” Linkevicius said. The FM once again revealed his support to Georgia’s Euro-Atlantic integration. Kurt Volker, an American diplomat who served as the US Ambassador to NATO, also condemned Russia’s actions in Georgia and other countries and said that Georgia should respond to Russian illegal actions with economic development and the advancement of its democratic institutions. He also stated that Georgia should be admitted into NATO despite the fact the country’s territories are now occupied by Russia. The Tbilisi International Conference has forged a reputation as a can’t-miss event for leaders across Georgia, the United States, and Europe. Each September, the conference brings together regional experts on security issues, along with Georgian policymakers, civil society activists, and the business community – with a view toward keeping Georgia high on the transatlantic agenda and keeping Georgia on track in its democratic progress and transatlantic aspirations.